Where can I buy a plastic or leather basket muzzle suitable for a pitbull in johannesburg or nelspruit? A good vet shop should be able to help you. Ask for a Baskerville muzzle. The new Ultra is the best of all. I am looking for a muzzle for a rottweiler – that will allow him to drink and pant. I live in Gordon’s Bay. Any suggestions? Thanks. I have a Baskerville plastic basket muzzle for you at our club. Do you ever come to Cape Town? Hi. We have a big breed boerboel that we were thinking of getting a muzzle for. Will mostly be used for vet trips [because of his size they are a bit cautious] and help with training. What type of muzzle would you recommend and where can i get one. We live in Cape Town Northern Suburbs. I am looking for a soft muzzle – probably the inexpensive nylon version – for my Golden Retriever to wear for short walks on the beach. Reason being that he is becoming addicted to eating the ever-present kelp on the beach which does not dissolve in the gut and can lead to costly vet procedures to remove. Would this be a way of addressing the problem? Where will I find such a muzzle in Cape Town? We live in the Fish Hoek area. Thank you. option would be a basket muzzle which you can order through your local vet shop. Hi! Where in Cape Town Northern suberbs can I buy a size 5 ultra baskerville muzzle for a Weimeraner? Ulternatively, what online shop would sell it and deliver to a remote rural location? Hi, could you please help me. I have two Siberian Huskies who make a lot of noise (barking and high pitched screaming) when taken for walks or when seeing other dogs. Would a muzzle be recommended to prevent them from making so much noise? and if so which one would you recommend? Unfortunately a muzzle will not do the trick but a halter might help. You can come and purchase halters from us or get them from your local vet shop. we have a small border collie type dog. She does not like Jack Russels and bites them. Do you have a mussle that lets her breeze on the walk and also is comfortable for her? A basket muzzle is ideal as your dog can pant and drink water. 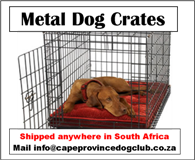 Mail info@capeprovincedogclub.co.za to place an order. Our Australian Cattle Dog wears a Hilti nose lead but is now required by the estate to wear a muzzle. What type and size would be best for him? A baskerville muzzle is the most comfortable as it allows your dog to pant and drink. A size 6 should fit. You can order through your local vet shop. I have an older rescue Ridgeback, who has been with me for three years. He is now not at all aggressive with people, but when I first got him he would snap if anyone reached towards his face. While he has been with me he has had no contact with children. As he was a stray, I do not know what his history with children was prior to him moving in with me. Early in January my niece and her two and a half year old daughter will be spending a weekend with me. In order that we all have a relaxed visit I think it will be wise for me to get a muzzle for Ben, but I would like him to have the muzzle that will be most comfortable for him. From the posts above it seems like I should be looking at a Baskerville muzzle. What size would I need and can I buy one from the Cape Province Dog Club? help you with the appropriate size. Thank you, Julie. If I have understood the info on the website, the shop will be open tomorrow, 31st, and I will come by. At a local pet shop I have tried a size 9 Baskerville, meant for a German Shepherd, but it seems a bit snug around the neck and side of the head. I would appreciate the expertise of someone with experience. Do I need to bring cash, or does the club take cards? Thank you, Julie. I will come by tomorrow, 31st. At a local pet shop I have tried a size 9 Baskerville, meant for a German Shepherd, but it seems a bit snug around the neck and side of the head. I would appreciate the expertise of someone with experience. Do I need to bring cash, or does the club take cards? I have just discovered that we are out of stock of the larger sizes – sorry about this. You will have to go to a vet shop instead. is a removable piece at the tip of the muzzle which you can remove if your dog’s nose is being squashed. If the muzzle does not fit snugly, your dog will get it off in 2 minutes. 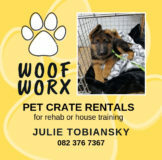 Hi which pet shops in the Cape Town area sells muzzlers my German Shepherd is 11 months and he does not like other dogs. Also leashes that gives your dog a bit of roaming space. You can purchase long leads from us – we keep 3m and 5m. For muzzles – we can order for you. Come and chat to Liz in our dog shop on a Saturday afternoon. I have an eight year old GSD female who is aggressive to other dogs when walking especially on the road. In parks she is calmer but still inclined to rush up to other dogs and if smaller than she is, attacks. So I have to keep her on a lead constantly. She is a strong dog and I find it difficult to hold on to her when she is in attack mode. I need a muzzle in order to walk her comfortably. Please tell me where I can purchase one that will allow her to breathe and lap water easily. Her nose measure from under they eyes is 11cms and circumference of nose is 35 cms leaving space both ways. What size should I look for please? Best would be a Baskerville muzzle which allows your dog to drink and pant. You can order through your local vet shop. Can I ask what is the price of the Baskerville muzzle you have? You can contact cpdogshop@gmail.com to see if we have the right size for you.